In addition to some tasty mulberry bushes, the garden is filled with peppers, cabbage, kale, and many, many tomatoes. It has been dubbed the "commissary" garden since the food supplements the diets of the animals in residence. The garden is not making a huge dent in the food budget, but it is local, sustainable, and the zookeepers know right where the food is coming from. They also know that the food really is organic and pesticide-free. The heat and drought of this spring and summer has been hard on the garden. The vegetables aren't the prettiest and we might turn our noses up at the result. 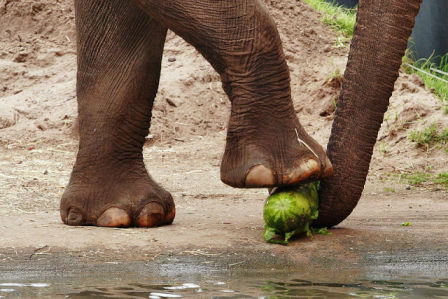 The animals are not as picky as we are -- especially the elephants. They will eat just about anything. This includes the trimmings from the mulberry bushes. One thing is sure about feeding the zoo animals from their own garden -- the end result will help fertilize next year's garden. The First Day Of Fall Bonus Animal Video Of The Day!! !